ARLINGTON, TX - MAY 12: Edinson Volquez #36 of the Kansas City Royals throws against the Texas Rangers in the first inning at Globe Life Park in Arlington on May 12, 2015 in Arlington, Texas. Over the weekend I was reminded of the most failed DFW sports marketing attempt this side of the Mavericks’ Trey J’s. Along about 2004 – before the arrival of Jon Daniels – the Rangers gushed over their young pitching prospects, two of which were acquired with Top 10 picks in the draft. Their names could be configured into a cutesy, relevant acronym – this was also before the arrival of iTunes and Netflix – and, voila, DVD was born. John Danks. 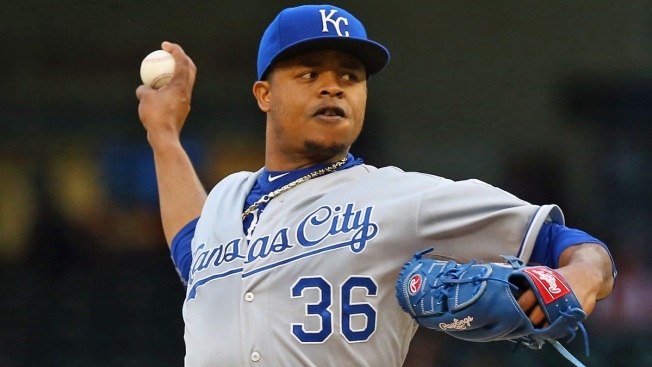 Edinson Volquez. Thomas Diamond. The future of Rangers’ pitching. It was catchy. It was sellable. It spawned hope. It … won a combined three games for Texas. The memories rushed back as I watched highlights of Volquez dominate and shut out the Yankees for his third win of the season for the Royals. Even after all these years, he’d look good in a Rangers’ uniform right now. But DVD never materialized beyond a marketing campaign. Danks, the 9th overall pick in the ’03 draft, struggled with control in the minors and was traded for Brandon McCarthy in ’06. Volquez was traded to the Reds for a slugger named Josh Hamilton in ’07. And Diamond, the 10th pick in ’04, underwent Tommy John surgery in ’07, causing a significant loss in velocity and, eventually, his outright release. A decade after the trio created hope, Diamond is long out of baseball with just one Major League win (with the Cubs in ’10), Danks is still a solid starter with the White Sox and Volquez – who produced the only three Rangers wins of the group – is still effective in Kansas City after a career highlighted by an All-Star appearance in Cincinnati and 13 wins last year with the Pirates. The style was there. But the DVD's substance was grossly absent.